Ermioni is a beautiful Greek coastal town, situated in the Ermionida area of the Argolida (Argolis) region of the Peloponnese, Greece. It is two and a half hours drive South-West of Athens International airport, and two hours by boat from the port of Piraeus. It is central to many places of historical and cultural interest. Ermioni is divided into 3 sections for all our info. Limani is located on the Northern side and is the commercial port, with the lively Mandrakia on the Southern side of the pennisula. At the far end of the town, at the Eastern point, is the pine-cladded forest area called Bisti which is an open-air archaeological site. Here one can enjoy leisurely walks at any time of the day, as there is plenty of shade from the sun. Also, you can swim in the clear blue sea from the rocky coves along the Southern side of the Bisti, which overlook the islands of Dokos and Hydra. The sea surrounds the town from 3 sides, giving the feel of being on an island, but without the possibility of being stranded in adverse weather conditions. Ermioni is referred to as a seaside town of captivating beauty. We find this is true because it still remains authentically Greek, traditional, charming, hospitable and friendly. For the visitor to Ermioni, there are numerous commercial amenities around the Limani port, banks, ATM machines, pharmacies, doctors, dentists, physiotherapists, tourist office (for car-hire and boat tickets), real estate offices, post office, taxis, buses to Kranidi and Kosta, assorted souvenir shops, mini-markets, butchers, bakeries, snackbars, beauty salons, hairdressers, internet cafes, restaurants, tavernas, cafes and bars. There is also a colourful weekly farmers market on Thursday mornings only, selling assorted fresh fish and fresh produce, various clothing, footwear and domestic household items. People come from all parts of Ermionida and nearby islands to enjoy this outdoor shopping experience. 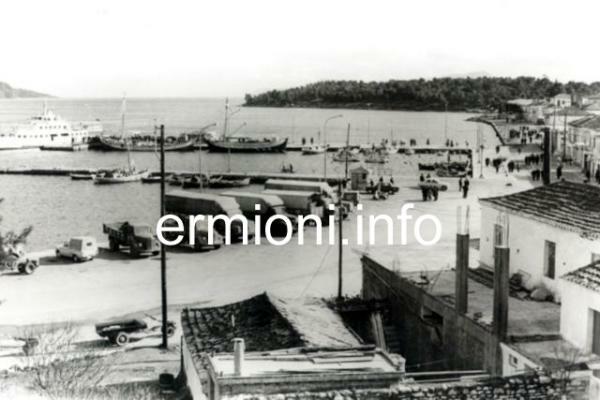 Limani port is usually the first point of arrival to Ermioni for most visitors, whether by road or by sea. One will find accommodation and holiday Rentals available in small hotels, hotel apartments and studios, various pensions and private modern or traditional Greek houses. All will provide a warm and friendly service to any visitor, as well as the many tavernas, cafes and bars along the waterfront. 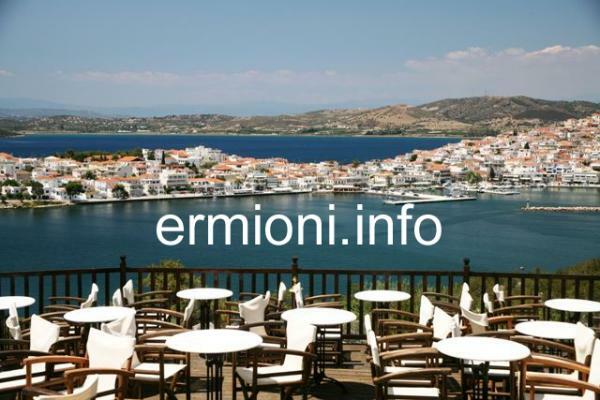 A hire car is advisable to travel around, as Ermioni is an ideal base for exploring the many historical sites and cultural towns and villages in the surrounding Argolida region. Some interesting places to visit nearby in Out and About are Kilada, Thermisia, Iliokastro, Loukaiti, Kranidi, Porto Heli, Kosta, Fourni and Didyma, all of which are close by. However, you may wish to go further afield to Places to Visit such as Nafplio, once the capital of Greece, Epidavros, Kazarma, Tiryns, Mycenae, Argos, Asine, Tolo, Galatas, Trizina, Methana, Isthmia, Ancient Corinth and the Corinth Canal. Take the opportunity to explore the pre-historic cave at Franchthi and the caves at Didyma, go rock climbing on Lizard Rock at Thermisia, go walking through the ravine of Katafyki, or just relax on the many nearby beaches and swim in the crystal clear blue sea. If you wish to explore the nearby islands, then the Argo-Saronic islands of Hydra, Spetses and Poros are just a short boat ride away from Ermioni. All three of these islands have their own individual character and will offer you a slightly different holiday experience. A new luxury super-yacht Marina is planned to be constructed in Ermioni, planned to be operational by Autumn 2021. Located at the Limani outer harbour, opposite the Ermioni Hermes football ground and alongside the road leading up to the church of Aghios Gerasimos (pictured at top) and the Milos (windmill) on Krothi Hill. Building plans have been approved and the area fenced off, with construction work due to commence end of 2019. Operated by specialists Camper & Nicholsons, the exclusive marina will blend discretely into a natural safe harbour and will accommodate more than 120 yachts, up to 65m in length. The complex will have its own bars, restaurants and shops, in addition to a swimming pool and chandlery. The new Marina will also provide a much needed 5-star facility for existing and prospective property owners in Ermionida, with a secure place to berth their yachts. Visiting smaller yachts and flotillas also have numerous places to anchor within the inner Limani harbour, or along the Southern Mandrakia waterfront, which has become very popular over the last number of years. 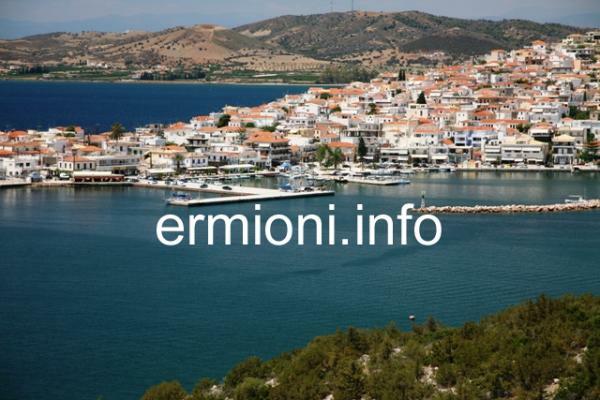 There are no private boat rental facilities in Ermioni, but you can contact the boat rental agencies that operate on the island of Poros. From Poros you will be able to sail around to Ermioni, as well as the beautiful Argo-Saronic islands of Hydra, Dokos and Spetses. The town's war memorial is situated in the main square (pictured right) in front of the tourist office, and is the main focal point of the Limani waterfront. From this point one can wander up Taxiarches street to the Old Village of Ermioni, situated on the crest of the hill. Explore some of the back streets and see the local people going about their everyday lives, of which many will greet you with a warm friendly "Yassas". The old village has the Ermioni Museum and Library, the Ermioni Toy Museum, the Byzantine Metropolitan church of Taxiarches (Archangels) and Panaghia (Holy Virgin). One of the main streets is called Melina Mercouri street, named after the famous late Greek actress, singer and culture minister, who's grandfather once lived in Ermioni. 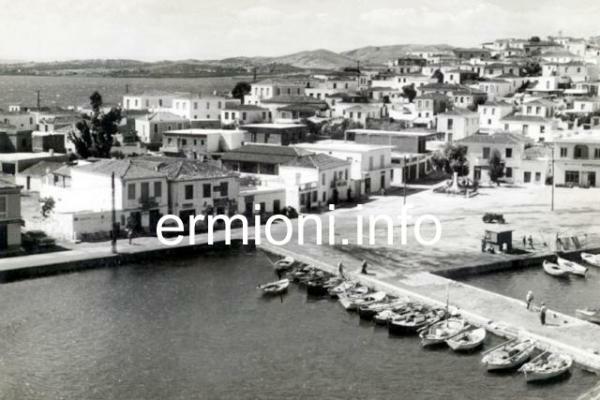 An important factor is that Ermioni has changed little over the last number of years, both in its appearance and in continuing to keep the local civic, historic and religious festivals and traditions alive, especially to the growing younger generation. If you have the time to visit in the Spring, then the Greek Orthodox Easter is a wonderful experience, as it is the main festival celebrated throughout Greece. 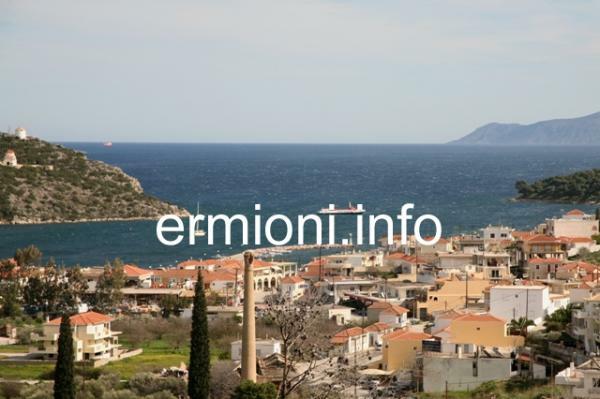 If you want to see the best panoramic view of Ermioni, then a walk or drive up to the Milos (windmill) is a must. The Milos is situated on Krothi Hill opposite the Limani harbour. The best time to enjoy the view is in the mornings, or early evenings as you watch the sunset over the town, the sea, the surrounding hills and distant mountains. Fresh fish can be bought daily from the local fishermen along the Limani waterfront, from a shop by the war memorial, or from the weekly Thursday market, located by the school adjacent to the Limani harbour. Wi-Fi is available in many cafes, bars and tavernas along Limani and Mandrakia, as well as the Library in the old village. 'Beyond the Acropolis - A Rural Greek Past' by Tjeerd van Andel and Curtis Runnels AMAZON About ancient Hermione and region. 'Papas' Greece' by Tessa and Bill Papas AMAZON An affectionate look at life in Ermioni and Greece in the late 1960s and 70s.